Corey Christiansen Bebop Blues PDF + Mp3 CD download. Bebop Blues book introduces the jazz language to the intermediate guitarist who already has a basic knowledge of the blues. Many guitarists are familiar with basic twelve-bar blues progressions and how to solo over this form using minor pentatonic scales, blues scales, and common blues licks. The material presented in this book will build on these basic blues playing concepts of adding color, expression, and sophistication to their music. The examples and exercises included here are easy to understand and enjoyable to play. Topics such as modes, bebop scales, enclosing (targeting), jazz comping, and chord construction are covered in standard notation as well as tablature. 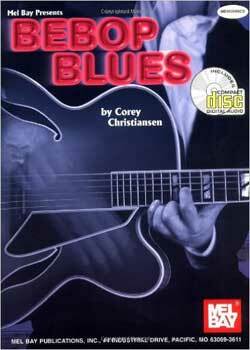 Download Corey Christiansen – Bebop Blues PDF free and other books from our site. Only high quality PDF scans. Please write a review, it's important for our community.